Digital photos designer utility is the best pictures collage tool that can be easily used to combine favorite photos or images into artistic compilation. Professional image editing application allows user to make beautiful photo collages complete with resources including templates, layouts, photo frames, special mask effects and word arts. ...... templates. Picture blender tool allows user to adjust transparency of photo and make it easy to achieve the perfect artistic blend of image and background photo. 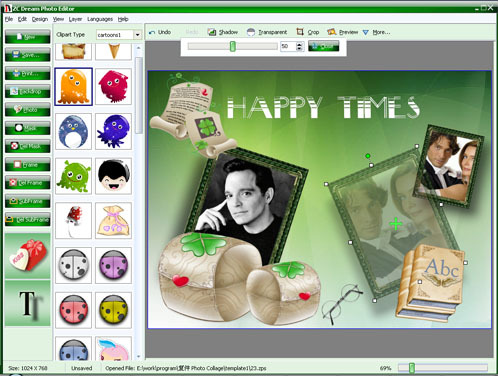 Images editing utility adds build-in frames to complete collage and one of the photos in collage. Professional photo editing tool can easily and effectively turn masterpiece into windows wallpaper. Advance pictures enhancement software saves artwork and display on screen and send for printing. Download free Images blending tool online to create wallpaper, poster, personalized greeting card and invitation card by applying masking effects. Qweas is providing links to Professional Photo Editing Software V2009.1.1 as a courtesy, and makes no representations regarding Professional Photo Editing Software or any other applications or any information related thereto. Any questions, complaints or claims regarding this application Professional Photo Editing Software V2009.1.1 must be directed to the appropriate software vendor. You may click the publisher link of Professional Photo Editing Software on the top of this page to get more details about the vendor.